Hair loss is a condition in which the hair falls at an abnormal rate eventually leading to partial or complete loss of hair. The scalp has at an average 100,000 hairs. A healthy scalp sheds hair continously and new hair replaces them.However when the scalp is not able to produce new hair to replace the shed hair, baldness develops. 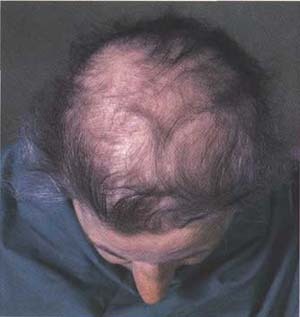 The medical term for hair loss is “alopecia“. The alternative names are Hair Fall, Baldness, Loss of hair. Excess of Pitta dosha in the body is the chief cause of hair problems. Pitta is increased by excessive intake of tea, coffee, alcohol, meats and excessive smoking. Pitta is also aggravated by eating too much fried, oily, greasy, spicy, sour, and acidic foods. Intake of too many chemical medicines, low blood circulation, anemia, general weakness after disease, stress, anxiety, and mental tension are also prime causes of hair loss. Chronic diseases like typhoid fever, presence of dandruff or lice and hormonal imbalance also cause hair loss. Lack of vitamins, insufficient nutrition - The most fundamental cause of hair loss is inadequate nutrition. 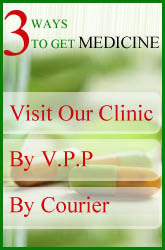 Persons lacking in vitamin B 6 lose their hair and those lacking in folic acid often become completely bald. But the hair grows usually after the liberal intake of these vitamins. Stress, Prolonged Illness, impure conditions - Other important causes of hair loss are stress such as worry, anxiety, and un-expected shock, general body debility caused by severe or long standing illnesses like typhoid, syphilis, chronic cold, influenza, and anemia; an unclean situation of the scalp that weakens the hair roots by jamming the pores with the collected dirt; and heredity Below are some of the most powerful home remedies for baldness that has benefited thousands of people world wide. Below are some of the most powerful home remedies for baldness that has benefited thousands of people world wide. take a balanced diet rich in protein, vegetables, cereals, fruits, carrots, milk products curd etc. egg , meat , fish, ghee , butter,thei will help in healthy grow of hairs. use medicated shampoo to avoid bacterial infection and ayurvedic shampoo to cleans ur hairs and roots. scalp massage with some herabl oils.its helps in circulting blood.by massaging with hands ina circular way blood start flowing to its normal. never do strong or gentle massage, always massage with ur fingre tips in roots of ur hairs. Fenugreek (Menthi) paste applied regularly on the scalp an hour before taking bath helps to overcome hair fall problem. Hibiscus leaves boiled in small quantity of water and along with Shikakai as a hair wash instead of soap,shampoo helps in controlling hair fall problem. This is also a natural hair conditioner. Neem paste applied regularly on the scalp before taking bath also reduces hair fall problem. with help of Amalaki Oil - Amalaki oil that is made by boiling dry pieces of amalaki in coconut oil, is considered helpful hair tonic for enriching hair growth. A mixture of an equal amount of fresh amalaki juice and lime juice, used as a shampoo also arouses hair growth and prevents hair loss. Fenugreek paste mixed with Castor oil (Erand) applied regularly before taking bath helps to overcome hair fall problem. Betel leaves (pan) grinded and mixed with Gingery (Til) oil or Betel leaves(Pan) grinded and mixed with Coconut oil applied on the scalp before taking bath helps to overcome hair fall problem. Eating Gooseberry (Amla)everyday and applying Gooseberry paste on the scalp regularly before taking bath helps to control hair fall. Applying Lemon juice on the scalp 10 minutes before bath helps to control hair fall problem. Hair Loss home remedy with Amaranth - Amaranth is a good home remedy for hair loss. Its fresh leaf juice must be applied to the scalp to prevent hair loss. It aids in the growth of the hair and keep it soft. Henna paste (mehendi) mixed with yellow portion of egg or henna paste with lemon juice applied on the scalp regularly before taking bath helps to reduce hair fall. Beet root leaves grinded with henna leaves applied regularly on the scalp before taking helps to reduce hair fall problem. Drinking wheat grass juice every morning for one and half month cures hair fall problem. Basil (tulsi) paste mixed with Gooseberry (Amla) powder applied 10 minutes before taking bath helps to control hair fall problem. Tea powder boiled in water can be used as a hair wash,which helps in reducing hair fall problem . You can make a hair oil of your own like this. Boil Fenugreek menthi seeds Neem or Sweet neem (Curry patta) leaves Gooseberry (amla),Henna leaves (Mehandi) some Basil (tulsi) leaves in Coconut oil or Gingery oil for 20 minutes in slow flame and store it.Use this regularly to Overcome all hair related problem.ith help of Amalaki Oil - Amalaki oil that is made by boiling dry pieces of amalaki in coconut oil, is considered helpful hair tonic for enriching hair growth. A mixture of an equal amount of fresh amalaki juice and lime juice, used as a shampoo also arouses hair growth and prevents hair loss. Gram flour (Besan) Mixed with curd or gram flour mixed Milk used as a hair wash helps to overcome hair fall problem. Applying Crushed raw papaya (Papita) paste on the scalp 10 minutes before taking bath is very helpful.This process assists in the exfoliation of dandruff flakes and slow down fungal Growth.Papaya contains enzyme papain which is very helpful in controlling hair fall. Massage the scalp frequently with a little almond oil. Wash hair with the decoction of Neem leaves to stop hair fall. It will not only stop hair fall but it also rejuvenates hair growth. mix 2 spoon honey with 1 spoon on cinnamon oil with 3 spoonof olive il .apply this paste on effected areafor 20 min then wash it off. olive and cocnut oil is very useful for dry hairs. application of egg yolk on hairs with water for 15 min is good for hairs. regular massage of hair oil like coconut oil olive oil castor oil is helpful in dry hair.coconut oil helps in getting long and strong hairs.u can milx amla in coconut oil for more effects.